Kangchenjunga (Nepali:कञ्चनजङ्घा Kanchanjaŋghā) SewaLungma (Limbu language) is the third highest mountain in the world (after Mount Everest and K2). 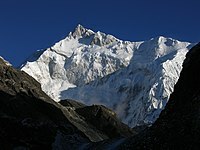 Kangchenjunga has an altitude of 8,586 metres (28,169 ft). Kangchenjunga translated means "The Five Treasures of Snows", as it has five peaks, four of them over 8,450 metres. It is one of the mountains in the range of the Himalayas. This page was last changed on 4 November 2017, at 23:00.